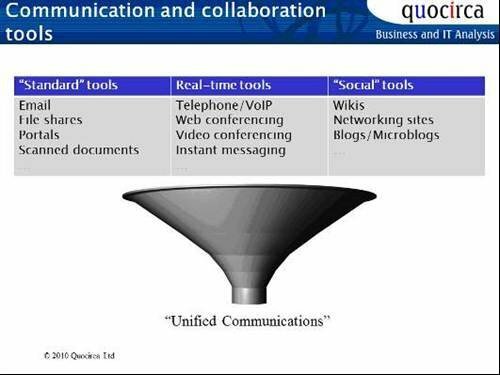 The explosion of communication and collaboration tools has provided many new methods of communicating and collaborating, but has also introduced many issues that organisations are struggling with. Early attempts at unifying the various tools into a cohesive system were either biased in a specific direction (eg all information ended up as some form of entry in a user's e-mail inbox – not a great deal of use to someone who's a phone junky), or were too cumbersome to use to embrace new technologies as they appeared. An uncontrolled approach to communication and collaboration meant that valuable information slipped between the different tools, and decision making was then based on "best efforts" – that is, only on the information the decision maker actually had access to. Organisations today no longer have the luxury to be able to reach decisions the way they did in the “good old days” (well, maybe five years ago).